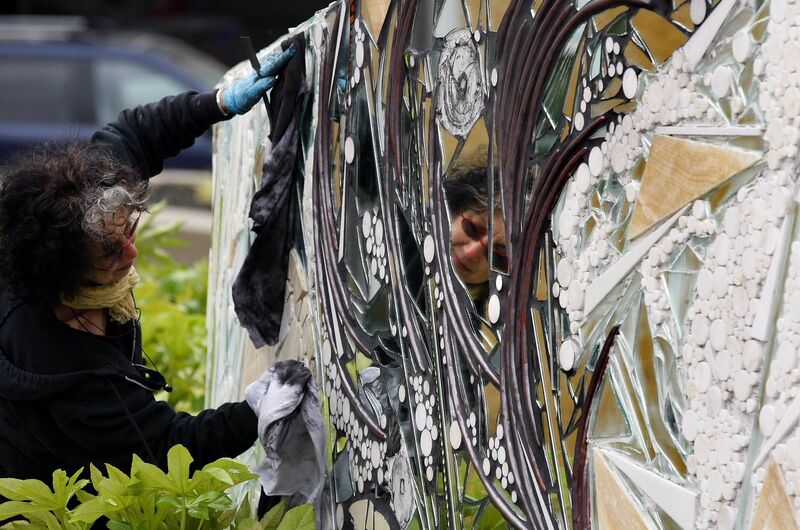 Artist Linda Beaumont is reflected in part of her mosaic installation at the new Wetmore Theater Plaza in downtown Everett. Wetmore Theater Plaza, the new community space in downtown Everett, is getting its first official event — a summer concert series. The Sets in the West concerts kick off July 10 with 10 weeks of live music from some top shelf, emerging bands from Seattle, Bellingham and Everett. The free shows start right after work at 5 p.m. There’s a wine and beer garden and food for anyone who wants to buy a drink or a snack. Bands include Hot Bodies in Motion, a soul-bluesy band from Seattle, and River Giant, whose lead singer is from Lake Stevens and who play folk Americana stuff, which has been compared to Neil Young. The city of Everett wanted to have a concert series at the plaza this summer but didn’t have the staff to devote to such an event. So the city asked the Everett Music Initiative to make the series happen. The Everett Music Initiative started out in 2012 and has successfully brought new bands to downtown Everett. The group’s goal was to bring the local pool of musical talent here because music is a critical cultural element to a thriving downtown, said Ryan Crowther, founder of Everett Music Initiative. The music initiative has partnered with Experience Everett, the city’s new tourism initiative, and together with support from the city’s cultural arts department, the experiment to bring new music to downtown Everett has been a success. The city already sponsors Music at the Marina concert series that kicks off June 27 and those concerts start a little later Thursday evenings. But the new plaza concert series happens right after work for a more “appropriate urban feel so people can get off work and enjoy the music,” Thomas said. The city also provides a children’s concert series Thursday mornings at Thornton A Sullivan Park at Silver Lake. which kicks off July 11. The plaza, situated between the Everett Performing Arts Center and Village Theatre’s Second Stage kids’ theater, can accommodate more than 400 people and, with a packed crowd, can give the downtown that kind of needed energy that comes from community events such as concerts and theater performances, Thomas said. The plaza isn’t officially complete. Whidbey Island artist Linda Beaumont continues work on the undulating mosaic wall that anchors the plaza and frames the area into a seated amphitheater. Beaumont is expected to be working on that mosaic into next year. The piece is handmade and completely original, Thomas said. “Art takes time,” Thomas said. But the public doesn’t have to wait to use the plaza. In fact, the city wants people to use the plaza now. And the concert series is a good starting point, said Steve Graham, a member of Everett Music Initiative. “This is going to be a great chance to showcase some great music, how beautiful downtown Everett and our new Wetmore Plaza (are),” Graham said. The new Sets in the West series kicks off July 10 and runs through Sept. 11 at Wetmore Theatre Plaza, 2710 Wetmore Ave., Everett. For a complete schedule of bands, go to www.everettmusicinitiative.org. This entry was posted in Arts & Entertainment, Local News and tagged entertainment, Everett, music, summer concert series, Wetmore Theater Plaza by Kim Kalliber. Bookmark the permalink.